Some 300 years from now the great Starfleet Captain Jean-Luc Picard will gaze out upon the star flecked void of space from the command bridge of the starship Enterprise, and remark, “Space: the final frontier…” in an accented tone that is as suave and confident as it is decidedly not French. Picard will have a mission of course, as any self-respecting space captain must–a mission to seek out and learn of new worlds, cultures, and beings. What the Enterprise and its crew will need more than anything else on this galaxy spanning investigatory mission, more than planet shattering firepower and high powered shields, is knowledge and an infrastructure for its rapid collection and recollection, deployment and redeployment. Medical staff, Engineers, Linguists, Historians, Tacticians, and so on–all the distinct elements of a Starfleet crew require access to an immense corpus of knowledge to further any task or situation which might arise, and they need to be able to access it quickly and efficiently. Which of course, they can, partly (mostly) because Gene Roddenberry and co. said they could, but theoretically because the systems on a hyper advanced starship would be more than capable of digitally storing information as well as an optimized interface for accessing that information. Nowadays, that they could possess such a system is probably one of the most mundanely believable elements of the fiction that is Star Trek because well, we can already do those things. We have digital archives, encyclopedias, databases, and more Star Trek fan-blogs than we can count without the assistance of computers (and we could digitally store their contents fairly easily). While the age of holodeck simulators, jumpsuits, and wise-cracking androids is still too long a way away for us twenty-first century types to hold out hope for their help, many researchers, professional and amateur alike, can still sympathize with the need for an effective means of storing, organizing, and recalling vast amounts of information. We may not have the ability to traverse the void of space in search of knowledge and interplanetary cooperation, but hey, at least we have the internet right? As historians Dan Cohen and Roy Rosenzweig have argued, digital media and the globe spanning network of the internet have provided us with an unprecedented ability to store, preserve, present, access, and interact with knowledge and data in its myriad forms. In order to get on with all the fun business of engaging and interacting with data however, a user must first be able to jump through a number of hoops and, given the mass of attractions and distractions the internet has to offer, the fewer hoops the user has to jump through to access content, the better. This is where an effective and efficient user interface comes in to play. An effective UI enables users to quickly and effectively navigate the digital landscape, parsing out irrelevant information and features to get to the crux of the matter at hand. In the case of digital collections websites like that offered by institutions like the National Museum of American History, an effective UI allows users to start digging through data and building up a personal library of material relevant to themselves and their interests. An ineffective UI on the other hand takes everything that is great and useful about digital media, and then adds the elements of frustration, confusion, and discouragement into the mix. When information is hidden behind cryptic presentation methods, or what author and web designer Vincent Flanders has referred to as “Mystery Meat Navigation,” the entire purpose of digital preservation goes up in smoke, and ends with the user closing tabs with a more than usual amount of gusto. For educational institutions like the Smithsonian, who seek to draw in a diverse and geographically scattered audience, maintaining an online presence is a great way to engage members of the public who may not be able to make the trip to Washington. The thing is, when it comes to the internet, the Smithsonian is up against stiff competition for users’ attention and time. People spend their time with thrift online, there’s always another Youtube video, another movie in your Netflix queue, a new track on Soundcloud that could just as easily occupy a user’s time as an online exhibit. Which is why effective UI is just as important as content. You can have the most fascinating story or artifact in the world, but if its tucked behind a plethora of sub-menus, archaic features, or requires an in-depth tutorial to use, you’re only going to lose viewers. Even something as simple as asking people to make an account can be a step too many You’d probably lose me at least. Which brings us to an interesting but flawed experiment in digital exhibit design published by the NMAH in the early days of the web, HistoryWired. 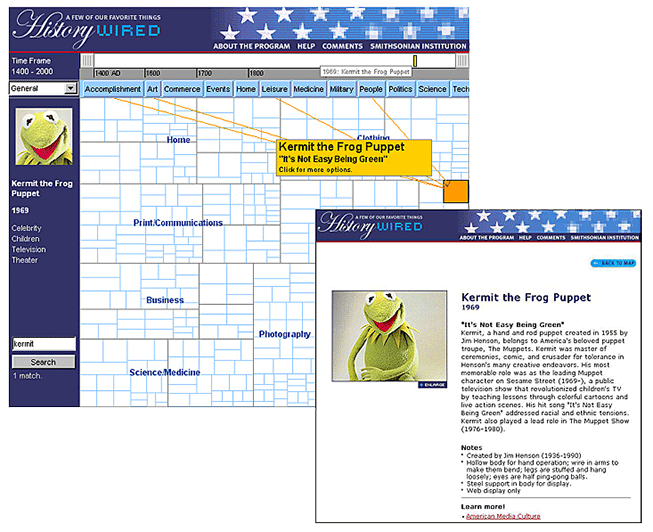 HistoryWired was a digital exhibit created for the Smithsonian in 2001 and it began with a great idea; to create a platform that would allow internet users the opportunity to explore a portion of the NMAH’s collections. To accomplish this a sample of 450 items, each accompanied by text profiles and links for further reading, were organized roughly by category, forming a digital map. Each tile on this map represented an object and, according to New York Times writer Matthew Mirapaul, each tile’s size was determined by user vote. On the surface it was an interesting concept but, for users looking to hone in on specific topic, there were certain difficulties. The map itself bears no immediate indication as to its contents, forcing the user to remember which of the blank tiles contained objects of interest to them. Some help came in the form of thematic tabs and an adjustable date slider which could highlight groups of objects, but these served only to narrow down the number of opaque tiles the user would have to wade through to find what they were searching for. A search box presented another tool, but seems to have been limited to single term searches. Say you heard about the Kermit the Frog Puppet that NMAH holds: Could you find it on this map? As the Arts category has been selected, Kermit is currently highlighted. Here it is! Since Kermit is a fairly distinct word you could probably just use the search box to find him, but what about other items? What if you had not heard that Kermit was an item contained within the collection? Certainly it could be said that HistoryWired, as a digital exhibit, was never meant to serve the same function as a digital archive and existed for an entirely different purpose. To my knowledge the Smithsonian never claimed it as anything more than an experimental exhibit meant to show off a sampling of their collections to internet users. With that said, even if the intent was simply to provide web visitors with an avenue to look at some of the museum’s collections, the visual format and user interface employed by HistoryWired does little to actually help the user spend their time efficiently and effectively. 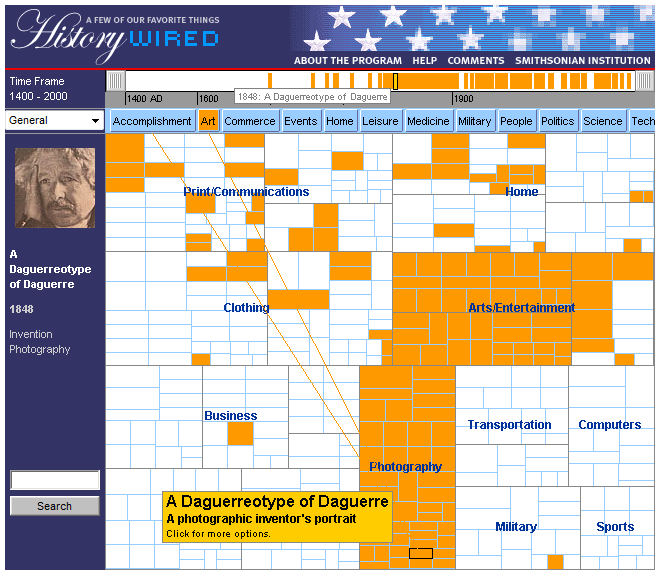 Rather than providing users with an actual tool through which to dig into these collections, HistoryWired seems more like a digital curiosity one passes by, clicks on a few squares, and then moves on to the next link. The web exhibit was ultimately retired in 2016 and in its place stands the NMAH’s Online Collections page which, while perhaps not a poster child for trendy cutting edge web-design concepts, is a far more effective tool for examining the site’s collections. Users can browse by Subject or Object Group, and once a selection has been made, they can narrow their search through a number of more advanced filters in the sidebar. Overall there are more options available to the user (though the search bar still lacks an advanced search option and the filter options are somewhat limited), and those options are for the most part presented with greater clarity to the user. To begin–I loved your introduction and now I totally aspire to be a historian on the Enterprise one day. I find the topic of an effective UI to be very interesting. I think this ties in nicely with Jockers’s discussion on Macroanalysis and last weeks article about the concept of “Why wasn’t I consulted.” Many humanities organizations make their content accessible digitally, there are only a handful who are doing it right–that is, with an effective and useful UI. Those who do have an effective UI are usually larger institutions with the funding to create such an interface, leaving smaller organizations in the dust. Like I discussed in my post about Jockers’s book, this doesn’t mean those smaller organization have less important content. In fact, they often offer content that is very important due to the fact that said sources have been understudied due to their lack of an internet friendly presence. That being said, even more well known historical figures are attached to clunky UI’s. For example, Eisenhower’s presidential library (https://www.eisenhower.archives.gov/). Despite the fact that presidential libraries are run in partnership with the National Archives, they all have varying UI’s. So while Eisenhower’s provides an interface that is somewhat lacking, Truman’s (https://www.trumanlibrary.org/index.php) falls somewhere in the middle, and Kennedy’s (https://www.jfklibrary.org/) is what I would consider be a friendly UI. It all comes back to a matter of funding, which again creates a similar disparagement in who and what gets attention as we have seen in the past with humanities research, and are currently trying to break out of. As a student of history, I obviously have spent a lot of time carrying out research via various digital archives and libraries. The amount of times I’ve gotten frustrated by an unfriendly and hard to use UI is more than I can count, as I’m sure we can all agree. But being that I enjoy the research process, as someone who’s committed their life to humanities (and a whole lot of money to get a degree in one) I usually stick it out and make it work. People who aren’t as invested in the study of the humanities may not stick it out as long, and as you said, end up closing a bunch of tabs and opening up a far easier-to-access website like YouTube. This is unfortunate because someone of clunkiest interfaces have some of the most fascinating content. Take for example, the online database for The American Jewess (https://quod.lib.umich.edu/a/amjewess/). The American Jewess is a fascinating publication from the late 19th century which serves to provide us with a wealth of information about American Jewish life and the lived experience of American Jewish women in the era (Just ask our own Pam Nadell, who is publishing a book which uses this publication for a lot of its primary research). But searching and reading through this digital database isn’t easily done, and requires a lot of patience, spoken from experience. My point here is you have to be pretty committed to get anything out of this database and others like it. While as historians we sometimes complain about the intrusive social media (i.e. last weeks discussion of how much justice you can do a source in 140 characters on twitter), we certainly have something to learn from them, and that is they all have beautifully designed and accessible UI’s. I often wonder what’s better, no digital presence or a small, clunky presence which could potentially turn people off from further study? I opt for the first of course, it’s better that the content is at least there to access, but I would love to know others thoughts on the matter. Hey Amanda, I think your question, “what’s better, no digital presence or a small, clunky presence which could potentially turn people off from further study?” is a really important one and something institutions need to consider carefully when they are considering a digital platform. I think an important part of that consideration, and one that is often left out, is who is the audience and what should they get out of this platform. Creating an online presence in hopes of increasing awareness of an institution or collection is often not enough and can lead to digital projects that are trying to do too much and reach too many people, effectively reaching no one. In our public history class two weeks ago, we talked about how appealing to the broadest audience possible often results in work that appeals to no one because the content becomes to broad for audiences to connect with it. To me, that seems like a major problem with HistoryWired. The interface was too broad for any audiences to make meaning with it. Although all institutions would benefit from carefully considering about their audience what they want a digital platform to accomplish, I think it is essential for smaller institutions with limited funding. It is easy to want to add more and more tools and more and more content, but ultimately that will likely hurt engagement. Next PostNext What do Downton Abbey and The Houston Daily Post have in common?